The Red Centre is Australia at its most iconic and to visit here is to embrace this ancient land’s spiritual past. Longitude 131° honours Uluru’s significance with moving guest experiences. The desert sky is clear, the night lit by a full moon and a canopy of stars. Your bed for the night is a double swag, set up on the deck of my tented pavilion at Longitude 131°. Alongside is a tray with bottles of cognac, port and Baileys, leather labels around their necks, and a bowl of popcorn. Before you is an uninterrupted view of Uluru (Ayres Rock), serene in the moonlight. Every Australian should see Uluru, and there is no finer way to do so than waking up to admire its rosy sunrise hue under the canopy of one of the 16 tented pavilions at Longitude 131°. This boutique resort – a member of the Luxury Lodges of Australia and one of the family-owned Baillie Lodges group since 2013 – is a special place where the detail is everything. This is why the lodge closed for four months last year to receive its most dramatic transformation yet. As part of the makeover, the Dune House that serves as the resort hub was expanded, the pool was reimagined as a modern outback billabong, Spa Kinara was added, and the Dune Top panoramic deck appeared. The singular two-bedroom Dune Pavilion also made its debut at the reopening. The contemporary homestead is a design triumph from architect Max Pritchard, who previously collaborated with Baillie Lodges on Southern Ocean Lodge on Kangaroo Island. 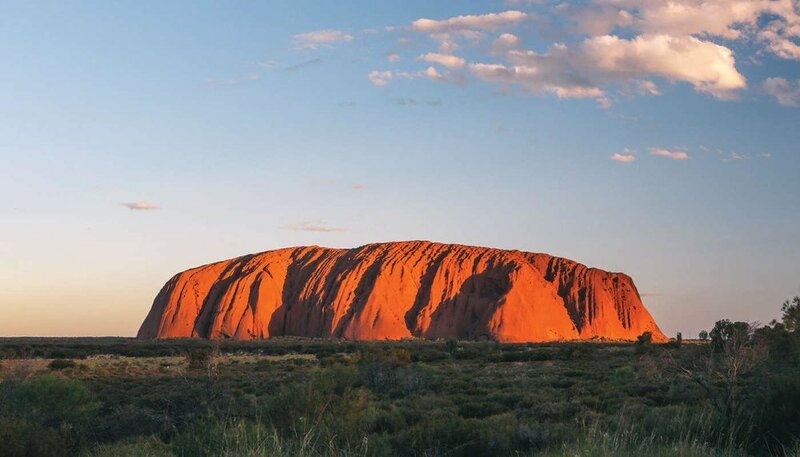 In a first for Australia, it offers views of both Uluru and Kata Tjuta, which can be admired from the comfort of your bed or, perhaps more decadently, from the bathtub. The incorporation of the Aboriginal culture into the fabric of the resort is one of the most striking things about Longitude 131°. 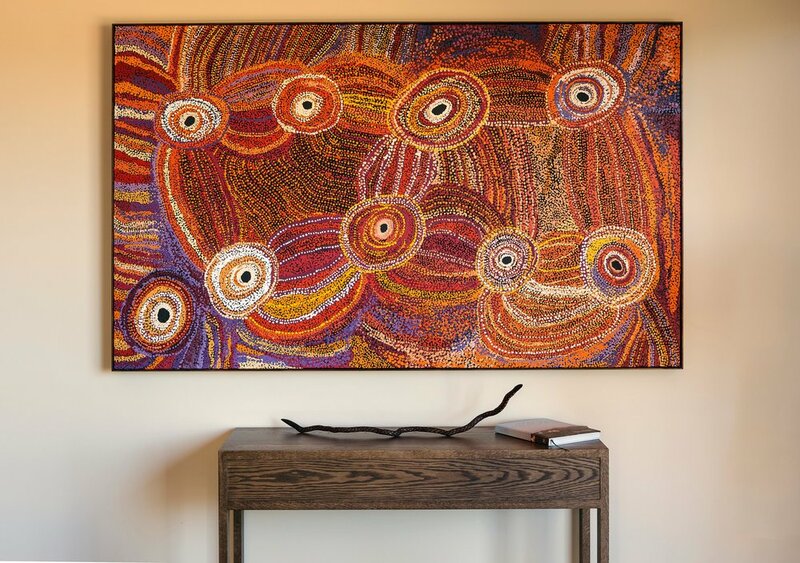 From the moment you arrive, you are surrounded by Indigenous art. As the afternoon cools, you head out for my first encounter with the monolith that brought me here. At a distance, Uluru is imposing. Up close, it’s surprisingly nuanced. The flora that flourishes in its shadow changes as we walk along the base and the brilliant ochre hues I had expected is more of a reddish-grey. We finish our stroll at Kantju Gorge with drinks and canapés. Above us, the Rock glows brilliant red in the setting sun. Most walks set off first thing in the morning to take advantage of milder temperatures, so sunrise the next day sees you walking in awe through Walpa Gorge. When you emerge, the domes of Kata Tjuta have you reaching for your camera. From this vantage, you can feel the vastness of the landscape, swallowing the lodge and its surrounds into red dust and the vast blue sky.. This connection continues as we return to Uluru at sunset, this time to walk through the 50,000 glowing stems that make up Bruce Munro’s mesmerising art installation, Field of Light. We then have dinner under the stars at Table 131°, an open-air restaurant nestled among the dunes. Executive chef Jonathan Bryant incorporates native ingredients such as lemon myrtle, pepperberry, desert lime and quandong into his dishes, creating a dining experience that ties you to the landscape. That is ultimately the enduring appeal of Longitude 131°. No matter where you are on the property, the pull of the landscape and the landmark is inescapable. From the architecture to the art, the lodge marks itself as a celebration of Australia’s spirit, past, present and future. This May Just Be the Most Luxurious Hiking Holiday Ever! A quintessentially New Zealand alpine experience - Soho Basin.